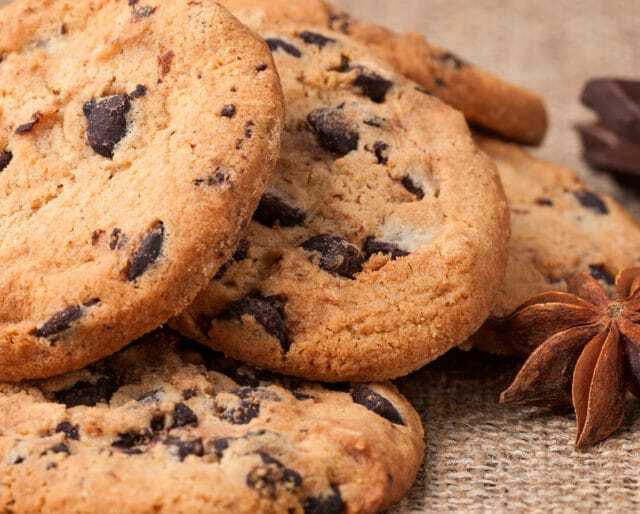 We sure do love our cookies, and on National Chocolate Chip Cookie Day we honor the most beloved cookie of them all. The chocolate chip cookie is one of the yardsticks for quality baked goods, and bakeries know that this adored edible is one of the most reliable ways to win the love and loyalty of the locals. Practically everyone in America has eaten a chocolate chip cookie, and hardly any of us had trouble loving the experience. More often than not, the very taste of a chocolate chip cookie is enough to transport us back to the halcyon days of our childhoods, bringing up memories of when the days were long and the milk was cold. We’ve tried chocolate chip cookies all sorts of ways — warm and gooey right out of the oven, fresh and chewy from the grocery store, the raw globs of dough mixed up into vanilla ice cream, and even mini cookies and milk in our cereal bowls for breakfast. But no matter what form your favorite chocolate chip cookie takes, there’s no denying that this triple-C confection holds a very special place in our hearts. We invite you to break out the milk with us and dip into National Chocolate Chip Cookie Day on August 4. Whether you pick up some pre-formed cookie dough at the grocery store or you whip up your favorite recipe from scratch, the ultimate way to celebrate National Chocolate Chip Cookie Day is to pop a cookie sheet in the oven and let that heavenly smell fill up your whole house. After they're baked, try a warm one off the cooling rack and enjoy that melted chocolate and chewy cookie combo. Even if baking at home isn't for you, there's always a way to share National Chocolate Chip Cookie Day with the people in your life. Home-baked or store-bought, you can still spread love by the baker's dozen by simply sharing some of your cookies with friends. Make up a few gift packages with some plastic wrap and paper plates, or invite over your friends for a cookie party. Just don't forget the milk! Bakers are always giving out free samples, and many bakers use National Chocolate Chip Cookie Day as a great excuse to introduce new customers to this most-beloved of cookie concoctions. On August 4, grab a friend and visit all the bakeries in your area. Depending on the baker, you might each get a free sample, a whole cookie, or even a chocolate chip cookie sampler pack complete with varietals like Chocolate Chocolate Chip and White Chocolate Macadamia for your tasting pleasure. Maybe it's the chocolate. Maybe it's the fact that the chocolate is concentrated into chips and isn't mixed evenly throughout the cookie. Maybe it's just because saying "chocolate chip cookie" is kinda fun. Whatever the reason, chocolate chip cookies really stand out to us as the cookie among cookies. Simply stirring some chips or chocolate chunks into a basic sugar cookie dough is enough to make magic happen. Becoming a cookie cake is the highest achievement to which any self-respecting cookie can aspire, and chocolate chip cookies seem to be our very favorite candidates. A standard cookie cake fills a pizza box and can be decorated with frosting, sprinkles, and other cake decorations. And yet, beneath it all, the cookie cake is really just a giant cookie you have no excuse not to share. So why not make it from the most well-loved cookie of all? Bakers often give out free samples, and the public's obsession with chocolate chip cookies has established this sweet treat as one of the ultimate standards for great baked goods. It makes sense that bakers give out bites of this beloved cookie to entice their customers and prove their baking prowess. The best part? You can probably find a free cookie within a few miles of your home on any given day.